When Bob Stoops shocked the college football world by retiring as the head football coach of the Oklahoma Sooners this past June, there was sigh of relief that was released in Stillwater from the folks who support the Oklahoma State Cowboys. In 18 years as the head football coach at Oklahoma, the Cowboys were only able to defeat Stoops and the Sooners four times in the Bedlam Game which consistently kept them from winning the Big 12 Conference more often. Oklahoma State has only won the Big 12 once compared to the ten titles that the Sooners have claimed. But with Stoops now enjoying retirement, will the Cowboys and head football coach Mike Gundy be able to take advantage? If you are a fan of watching wide open offenses in college football, then you need to pull up a chair and take a look at Oklahoma State’s passing attack. The Cowboys were ninth in the nation last season in passing offense and you can expect more of the same this time around. Senior quarterback Mason Rudolph has five games where he passed for at least 300 yards last season which included going for 540 yards in a victory over the Pittsburgh Panthers. Rudolph passed for more than 4,000 yards last season and if he does it again, we’re more than likely looking at the Big 12 Conference’s Offensive Player of the Year. Last year as a junior, wide receiver James Washington tallied 71 receptions for 1,380 yards. Washington could have left school early in order to pursue a career in the National Football League, but he decided to return to Stillwater for his senior season. And as Washington has returned to Oklahoma State, he will be one of the favorites to win the Biletnikoff Award as the nation’s top wide receiver. Washington is a speed demon at the wide receiver position and his ability to draw attention from opposing defenses should open things up in the passing game for his teammates. It isn’t just about Oklahoma State’s passing game as they were 14th overall in the total offense in the nation last year. As a true freshman, running back Justice Hill gained 1,142 yards on the ground last season, and as he is the perfect compliment to the Oklahoma State’s passing game, reaching the 1,500-mark in the category is not out of the question for him this season. The Cowboys offense should once again be set to shine for head football coach Mike Gundy as the Cowboys arguably possess the best offensive line in the Big 12 Conference. Led by left tackle Aaron Cochran, the Cowboys will have four seniors on the starting offensive line as that experience should give them edge in the race to win the Big 12 Title. Defense continues to be an issue for the Cowboys as they were 92nd in the nation last season in total defense. One key player to look out for this season will be senior free safety Ramon Richards. However one man alone does not make a team and the Cowboys lack of talent on defense could hinder their chances of making the College Football Playoff. The Cowboys are in possession of a very manageable non-conference schedule, while their chances of winning the Big 12 Title will come down to consecutive road games in October versus the Texas Longhorns and West Virginia Mountaineers, along with getting past the Sooners at home in Bedlam on November 4. The 2017 college football season will have a different feel to it for the Oklahoma Sooners as for the first time since 1998, Bob Stoops will not be leading this team onto the field. In 18 years as the head football coach at Oklahoma, Stoops comprised a record of 190-48, while going 121-29 within the Big 12 Conference. Under Stoops the Sooners claimed 10 Big 12 Conference Championships, along with one national title as he led Oklahoma to a bowl game in each of his seasons in Norman. 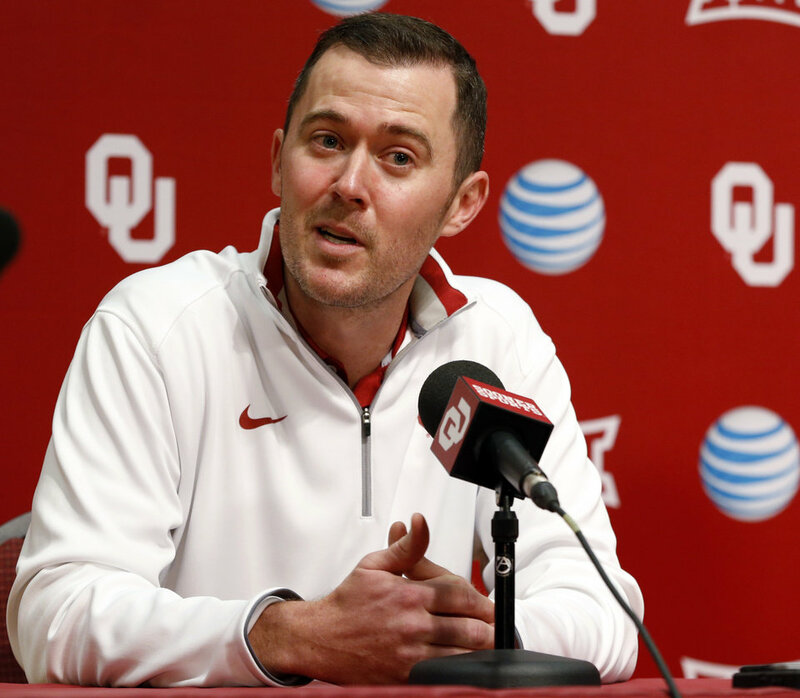 But as nothing last forever, it will be up to Lincoln Riley to replace Stoops at Oklahoma. Riley has spent the last two years as Oklahoma’s offensive coordinator. And although that Riley is only 33-years of age, the folks in Norman have confidence in him that he’ll be able to keep the Sooners machine going which will be important as the expectations are once again high for Oklahoma. A big reason why the expectations for Oklahoma are lofty is because of senior quarterback Baker Mayfield. 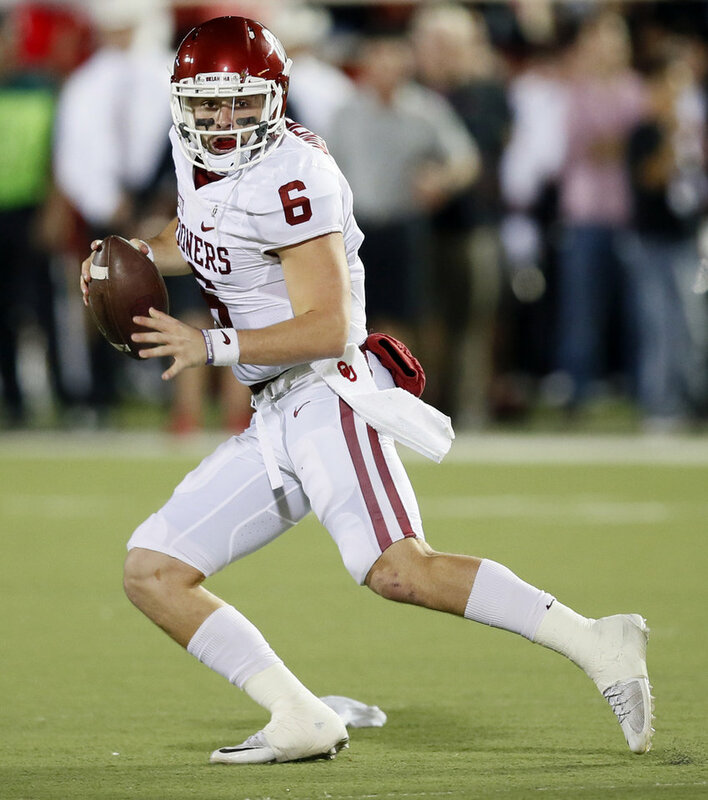 In two years as Oklahoma’s starting quarterback, Mayfield has been a finalist for the Heisman Trophy twice, while also being named as the Big 12 Conference’s Offensive Player of the Year. Mayfield has only thrown 15 interceptions with Oklahoma as his elusiveness allows him to keep plays open and make things happen which makes the Sooners so dangerous. But unlike the last two seasons the Sooners don’t have the same amount of talent around Mayfield on offense like they did in recent years. The Sooners must replace more than 2,300 rushing yards that is now in the National Football League in the form of running backs Semaje Perine and Joe Mixon. Last year as a freshman, running back Abdul Adams averaged 5.3 yards per carry as the understudy to Mixon and Perine, but now he will be getting the bulk of the carries as it is all about speed with him. Oklahoma is also inexperienced at wide receiver and the same can be said about their offensive line where they’ll only have one senior in center Erick Wren. Defensively Oklahoma will be okay since the unit will still be led by defensive coordinator Mike Stoops. Senior middle linebacker Emmanuel Beal and senior outside linebacker Ogbonnia Okoronkwo will be vital members to the Sooners potential success on defense as it all about athleticism on the defensive side of the football for Oklahoma. Riley will be entrusted to keep the Sooners machine going, but his first time around the block won’t be easy. Oklahoma will travel to Columbus to face the Ohio State Buckeyes of the Big Ten Conference who came to Norman and won as the rematch won’t be easy. The Sooners will also have road games within the Big 12 versus the Baylor Bears, and Oklahoma State Cowboys, along with their annual meeting in Dallas against the Texas Longhorns. Oklahoma should continue to be one of the top teams in the Big 12, but they’ll take a step back in regards to being the top team in the conference. 2016 was a typical year for the Kansas State Wildcats on the gridiron as there were not that many expectations for them, but they found a way to be successful. The Wildcats went 9-4 in spite of the fact that they were never in the top 25 of the Associated Press Poll. It also marked the Wildcats second nine-win season in the last three years as head football coach Bill Snyder continues to do it without getting five-star recruits. Snyder has made it his business to find players who have a chip on their shoulder after being overlooked by the bigger football programs, while also bringing in junior college talent. And as that philosophy has helped Kansas State under Snyder, they could once again be a dangerous team here in 2017. The Kansas State passing game was not a thing of beauty, but with senior quarterback Jesse Ertz set to begin his second season as the Wildcats starting signal caller, he should be able to generate more consistency. Ertz’s best asset is his legs as he was the Wildcats leading rusher last season. And if Ertz is able to get to the edge, the chances of him getting past most linebackers are good. For defensive coordinator Tom Hayes, he may have one of the better units on that side of the football in the Big 12. Last year as a freshman, defensive end Reggie Walker was able to record 6.5 sacks, and he is ready to become one of the better edge rushers in the conference. The Wildcats secondary is loaded with ball hawks as they recorded 16 interceptions in 2016. And junior cornerbacks Duke Shelley and D.J. Reed are ready to once again test their skills against the best wide receivers that the Big 12 has to offer. The Wildcats won’t be tested in their non-conference, but if they can get past road affairs with the Texas Longhorns and Oklahoma State Cowboys, along with welcoming the Oklahoma Sooners to the Little Apple on October 21, they could be a sleeper to win the Big 12. 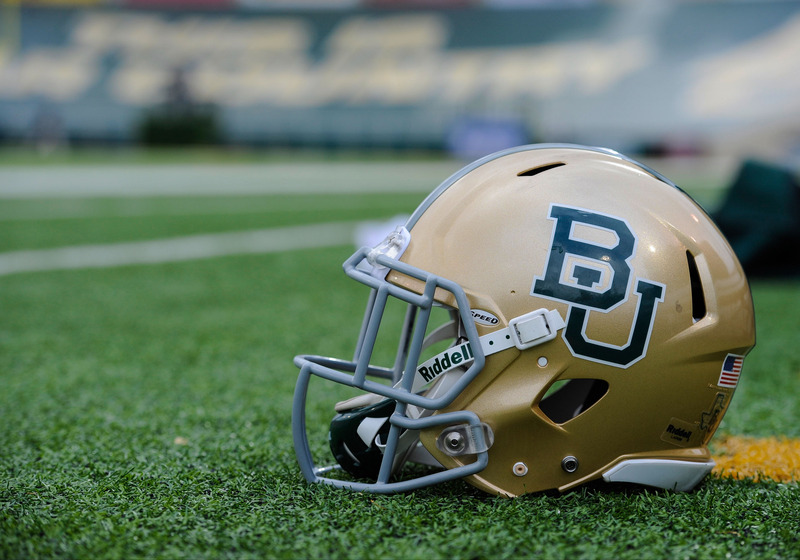 It has been a tough 15 months around the Baylor Bears football program. In wake of a sexual assault scandal that tarnished the school, Art Briles was fired as Baylor’s head football coach in 2016 as his 65-37 record at the school could not save him from the shame that had been brought upon the university by the scandal and cover up. Last year saw former Wake Forest Demon Deacons head football coach Jim Grobe lead Baylor. Grobe had come out of retirement to lead the Bears a 7-6. However the off-the-field issues caught up to Baylor on the field as after starting the season 6-0, they would lose their next six games before rebounding to defeat the Boise State Broncos in the Cactus Bowl. And as Grobe was simply the stop gap guy at Baylor, school officials set their sights on finding a head coach who would be able to navigate them through these tough times, while helping the team shed its tarnished image. Matt Rhule spent the previous four seasons as the head football coach of the Temple Owls and in the process led them to the American Athletic Conference Title last year. Rhule comes to Waco with a record of 28-23, but more importantly he was brought in due to the fact that he made Temple who had a reputation of being a subpar program into a winner. Last year as a freshman, quarterback Zach Smith got his feet wet when quarterback Seth Russell succumb to an injury. Smith went 1-3 as a starter, but his play improved in each game which should be able to carry over to this season under Rhule. Rhule has always been focused on the running the football which should continue with junior running back Terrence Williams leading the way this season for Baylor. Williams is coming off of a season where he averaged 5.7 yards per carry which included him gaining at least 100 yards in a game four times. But now with Williams set to be the feature back, those numbers should increase. And the running ability of Williams will be very important since Baylor doesn’t have the explosion at the wide receiver position that they’ve had over the past few years. However Rhule will inherit a very experienced offensive line which includes three seniors and two juniors. Senior left tackle Maurice Porter and senior center Tanner Thrift are both anchors on this unit and it would not surprise me to see either player be All-Big 12 performers this year. Solid defensive football hasn’t been a trademark for Baylor which was evident by the fact that they were 81st in the nation last year in total defense. Upon taking over at Baylor, Rhule named Phil Snow as the team’s defensive coordinator. Snow spent the last four years serving as Temple’s defensive coordinator under Rhule which included the Owls being third in the nation in total defense last season. 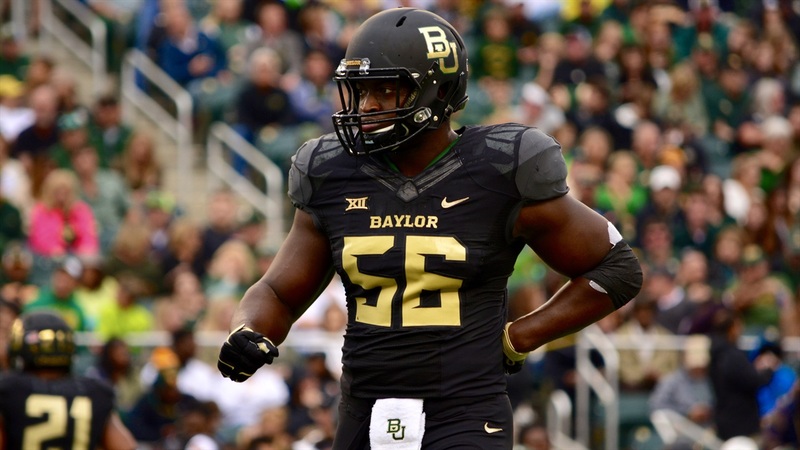 Any success that Baylor intends to have on defense this year will hinge on the play of senior defensive end K.J. Smith and senior outside linebacker Taylor Young as Rhule and Snow are attempting to adjust to life in the Big 12. As Baylor is looking to once again be one of the top teams in the Big 12, they will be tested as soon as conference play begins when they host the Oklahoma Sooners on September 23. However with road games versus the Kansas State Wildcats, Oklahoma State Cowboys, and TCU Horned Frogs, it is going to be a long shot for the Bears to finish with the top spot in the conference. The West Virginia Mountaineers spent the entire 2016 college football season flying under the radar. But when it was all said and done the Mountaineers had won 10 games for the first time as members of the Big 12 Conference. The Mountaineers only suffered two conference losses as they fell to the Oklahoma Sooners and the Oklahoma State Cowboys. The last time that West Virginia had consecutive 10-win seasons came in 2005 and 2006 when they were in the Big East Conference. But for West Virginia head football coach Dana Holgorsen, will he and his team be able to avoid taking a step back after a successful 2016? In 2015, Will Grier was emerging as the quarterback who was going to return the Florida Gators to prominence. In six games as Florida’s starting quarterback, Grier was 6-0 which included orchestrating a comeback victory over the Tennessee Volunteers. But on October 12, 2015, Grier was suspended by the NCAA for one year after it was revealed that he tested positive for performing enhancing drugs. Grier decided to leave Florida as he found a new home at West Virginia. And after Grier sat out 2016, he will be the guy who is under center in Morgantown. 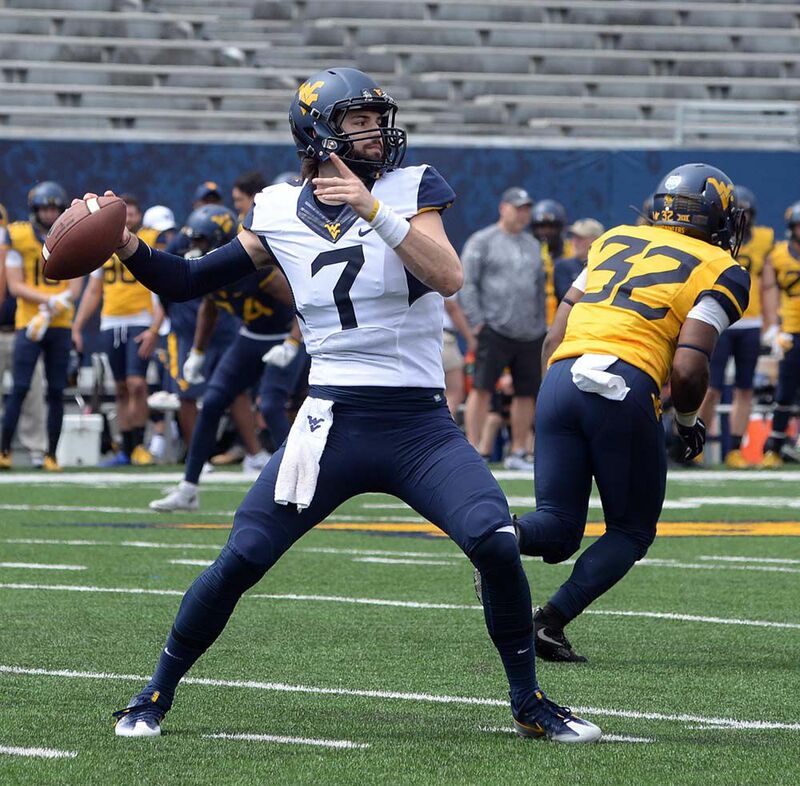 What Grier brings to the table for West Virginia is a player who has a strong and accurate arm which will bode well in Holgorsen’s system. And if Grier is on point, he has the potential to be the Big 12 Conference’s Newcomer of the Year. As a team the Mountaineers averaged 5.2 yards per carry in 2016 with the majority of that production coming on the legs of running back Justin Crawford. Crawford ran for 1,184 yards last season which included rushing for 331 yards against the Oklahoma Sooners. Crawford’s speed and versatility are the perfect compliment to the Mountaineers passing game which should translate to another solid offensive season for West Virginia. Senior middle linebacker Al-Rasheed Benton leads a defensive unit that will looks to shed its image of being lackluster as the Mountaineers cannot solely rely on the offense to win games for them. West Virginia will get a big test to begin the college football season as they’ll travel to FedEx Field in Maryland to meet the Virginia Tech Hokies of the Atlantic Coast Conference. This year might not be as easy for West Virginia to navigate through the Big 12 as their schedule includes road games against the TCU Horned Frogs, Baylor Bears, as well as the Kansas State Wildcats, while they’ll finish up with the Texas Longhorns and Oklahoma in consecutive weeks. The start of the 2017 college football season will see the Texas Longhorns in an unusual position. This marks the first time since 1989 that the Longhorns have finished unranked in the Associated Press poll in at least four consecutive seasons. Texas finished 5-7 in each of the last two seasons which led to the dismissal of Charlie Strong as the school’s head football coach and the hiring of Tom Herman. Herman takes over at Texas after going 22-4 in two seasons as the head football coach of the Houston Cougars which included leading them to their first Peach Bowl victory in school history. Now Herman is charged with getting Texas back among the elite of college football as the money and resources in Austin are second to none. After the Longhorns offense was stuck in the mud last year, there should be more fluidity this time around. A few years ago quarterback Shane Buechele was a highly touted high school prospect who decided to remain in the Lone Star State. Buechele took his lumps as a true freshman in 2016, but he was also able to flash his potential by throwing 21 touchdowns. And in Herman’s offense, Buechele has the potential to be as good as advertised due to his strong right arm, along with his pocket presence. It will be hard for Texas to replace the contributions of running back D’Onta Foreman who rushed for 2,028 yards last season. But it will be up to junior Chris Warren III and sophomore Kyle Porter to provide some balance for the Longhorns offense. However for Texas to once again become respectable, it is going to have to start on defense. Last year the ‘Horns were 94th in the nation in total defense which included surrendering at least 40 points on four occasions. Todd Orlando served as Herman’s defensive coordinator as Houston where his unit was 13th in the nation in total defense. What the Longhorns must get back to is not only winning the recruiting battle within the State of Texas, but also playing with an attitude on defense. I expect Orlando to light a fire under his unit, but will it be enough to help the Longhorns get back on track? Texas will get tested this season which includes traveling to the Los Angeles Memorial Coliseum on September 16th to face the USC Trojans in the first meeting between the schools since the 2006 Rose Bowl. And when Big 12 pay begins, Texas must face the Oklahoma Sooners and Oklahoma State Cowboys in consecutive games, along with having to meet the Baylor Bears, TCU Horned Frogs, and West Virginia Mountaineers all on the road. Herman’s first year in Austin will be tough, but it should end with the Longhorns playing in a bowl game. After winning a combined 23 games in 2014 and 2015, the TCU Horned Frogs took a big step backwards in 2016. TCU finished 6-7 as things never seemed to come together for them. But as the Horned Frogs got away from their winning ways, head football coach Gary Patterson was able to coach his team up just enough to get them to a bowl game. And hopefully for the Horned Frogs, that extra practice time will be able to translate to bigger things for them this season. For Texas Christian to have a shot at being a force in the Big 12 Conference, they will need improved quarterback play. Last year quarterback Kenny Hill was up and down which was evident by him throwing 17 touchdown passes and 13 interceptions. Hill has a big arm and his athleticism allows him to keep plays going. However as Hill’s senior season is set to begin, he will need to be locked in for the Horned Frogs. Senior running back Kyle Hicks is a solid ball carrier for TCU, while he will running behind an experienced offensive line that has three seniors which includes left tackle Joseph Noteboom. Patterson built his reputation on the defensive side of the football, but in recent years the Horned Frogs have been giving up more yardage and subsequently more points. Last year Texas Christian was 76th in the nation in total defense. However players such as senior outside linebacker Travin Howard who led the team in tackles in 2016 with 130, and senior safety Nick Orr whose 4 interceptions were tops on the unit last season are back. TCU was also eighth in the nation in sacks with 43 as they will need to once again be able to create pressure in order to slow down the high octane offenses of the Big 12. 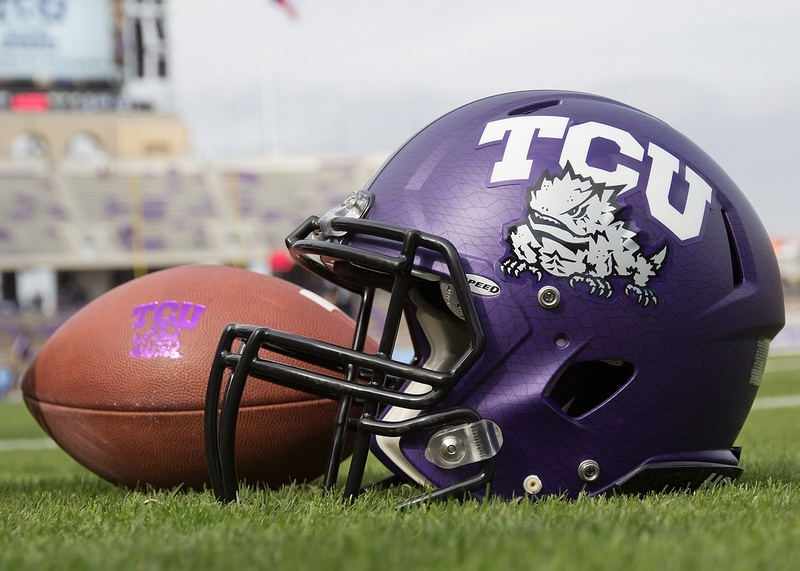 Road games versus the Oklahoma State Cowboys, Kansas State Wildcats, and Oklahoma Sooners will make it difficult for TCU to win the Big 12, but overall they stand to be an improved team as compared to last season. If you enjoy the fireworks that come with a prolific passing offense, then cozying up in your favorite chair to watch the Texas Tech Red Raiders is the thing for you. Last year the Red Raiders scored at least 50 points in a game six times as they averaged 566 yards per game en route to possessing the top offense in the nation. But as good as things were for Texas Tech on offense, it was just as bad on defense as they were last in the nation in total defense being that they surrendered 554 yards per contest. Kliff Kingsbury has been the Red Raiders head football coach for the last four years and he has kept the school’s tradition of wide open offenses going which included the tenures of former head coaches Spike Dykes and Mike Leach the school. And although that Texas Tech will indeed be a long shot to win the Big 12, things should be exciting once again in Lubbock. Quarterback Nic Shimonek stood on the sidelines last year as the understudy to Patrick Mahomes as he watched him pass for more than 5,000 yards. But with Mahones leaving school early to try life in the National Football League, it is Shimonek’s chance to sling the football around. Shimonek saw some time in relief of Mahomes last year on four occasions. But being that Kingsbury’s offense relies on the quarterback taking the majority of his snaps out of the shotgun, Shimonek should be able to get the football out quick enough in order to keep Texas Tech’s offense rolling. However Shimonek is going to have to do things behind an inexperienced offensive line as the Red Raiders won’t have any seniors in the unit, as it will be bolstered by three sophomores and a true freshman in right guard Jack Anderson. Being that the Red Raiders were last in the nation in total defense, it can only get better. Sophomore middle linebacker Jordyn Brooks was Texas Tech’s leading tackler last season, but it will need to be a group effort in order to improve. The Red Raiders must find a way to get off of the field on third down as they allowed opponents to convert on 43% of their third down situations, while they only tallied 14 sacks as a team. Just like 2016, the Red Raiders will be fun to watch on offense, but without a quality defense don’t expect them to be one of the top teams in the Big 12. The Iowa State Cyclones football program has never been considered as a powerhouse. The Cyclones have never won the Big 12 Conference and their last bowl appearance came in 2012. Since then Iowa State has not won more than three games which includes going 2-7 in each of the last two years within the Big 12. And by the looks of things, it won’t be getting better anytime soon in Ames. 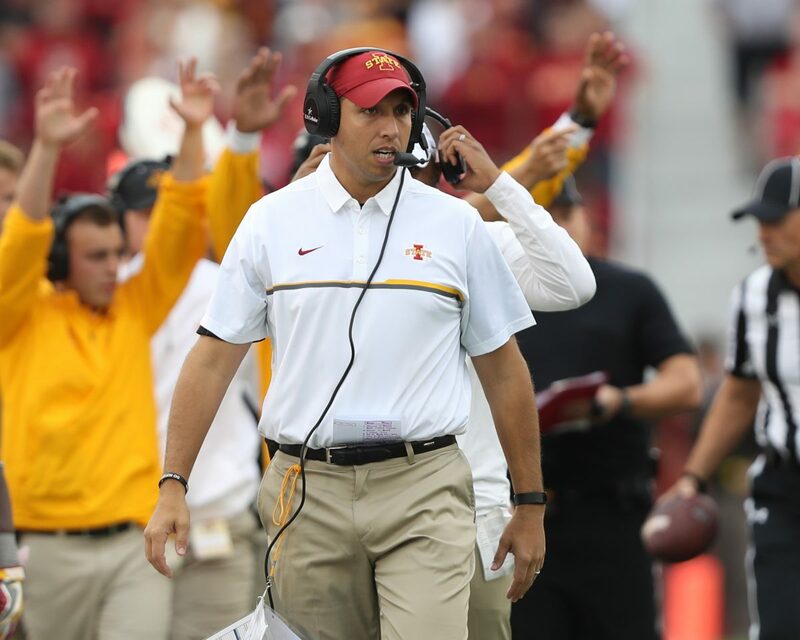 For Iowa State head football coach Matt Campbell, one standout player on his team will be junior outside linebacker Willie Harvey. Harvey has solid instincts and if he were on a better team he would be a household name. It will once again be an uphill battle for the Cyclones as their non-conference schedule includes games with their in-state rivals in the Northern Iowa Panthers and Iowa Hawkeyes, while their Big 12 schedule kicks off with them hosting a Texas Longhorns and traveling to meet the Oklahoma Sooners. And for the folks in Ames, it is once again going to be a long football season. You have to go all the way back to 2008 to find the last time that the Kansas Jayhawks finished a college football season with a winning record. Since then the Jayhawks have been relegated to being just another team in the Big 12 Conference as the parade of success has passed them by. Kansas has not won more than three games in a season this decade as things have been extremely tough for them on the gridiron. And as a new college football season is set to begin, does Kansas head football coach David Beaty have any tricks up his sleeve in regards to getting things turned around for the Jayhawks? Being that Kansas was only able to win two games last year, they were 106th in total offense and 109th in total defense. Offensively one shining star for the Jayhawks could be junior wide receiver Steven Sims Jr. At 5’10”, 176 lbs., Sims will use his speed to navigate his way through traffic in the secondaries around the Big 12 as he looks to make Kansas relevant. Junior defensive end Dorrance Armstrong Jr. led the Jayhawks in sacks with 10, and his ability to rush the passer is going to be important if Kansas is going to be able to pull off some upsets this season. Whereas Kansas has been passed by in the Big 12 for a decade, that trend will continue here in 2017 as they simply do not have the talent to keep up.